Of All the Evil Gods that exist, the most vile one that is, has to be Hedorah. This slimy beast was once an alien monster that fed on the wastes of humanity's industry. Hedorah proved to be one of Godzilla's most powerful foes on earth due to his nature. As long as the pollution existed, Hedorah had little chance of being defeated. It was only through the efforts of man and monster alike was the demon of slime able to be defeated. This incident provoked a major change in the practice of industry and because of this Hedorah would not rise again. In the time of magics and war, the alien creature adapted and instead of feeding on waste chemicals, the vile monster adapted to feeding on the waste energy of ambient magic forces. The monster stayed in hiding for many years. But when disaster struck, the monster, like all the others became infused with a massive burst of energy and obtained Godhood. Hedorah at once created his own domain of poisons and terrible chemicals. Hedorah is the God of Poison and Corruption. Hedorah is the living embodiment of poison, his creation has formed a whole new kind of magic. Poisonous Magic is his to command, and his powers are great and many based upon this new and vile magic. They are as follows. Shapeshifting: Hedorah's body is only semi solid and can transform into different shapes. One for the water, another for the air and one ultimate form for the land. Hedorah can transform into any of these shapes at will and nearly instantly. Due to this power and his body status. Hedorah is very difficult to damage and nearly immune to energy weapon attack. Energy Absorption: Hedorah can absorb any amount of excess energy. This is his main source of power and since there is so much of it all over the world, Hedorah enjoys a constant stream of nearly limitless power, however this is a well known fact and energy negating powers are very effective in stopping it for a time. Toxic Cloud: Hedorah can constantly emit a cloud of sulfuric mist in a mile radius. This mist eats away at flesh and all materials alike. Hedorah often uses this power in battle to cause his enemies immense amounts of pain and distraction. Acid Shot: Hedorah can use his own body as a weapon and fire off chunks of it at will. This acid is very strong and can even consume faster then most of the Gods regeneration powers. Since this is part of his body though, he rarely uses this attack. Darkness Shroud: Hedorah hates the light of the day, he is capable of summoning a smog cloud to cover the light of day for up to twelve hours. The undead can live in this, but all living things suffer breathing difficulties under it's effect. Hedorah can also make it rain acid at will from this cloud. This power takes up massive amounts of energy and is rarely used. Crimson Eye Beam: This is Hedorah's greatest power. From his red eyes he can fire red beams of death that seem to have two effects. The first is a great concussive force, but after this the explosion is capable of producing mystical poisons and acid effects nearly negate regeneration on all levels. Hedorah does not need to make a direct hit for this to work and misses on purpose to watch as the fumes overtake his opponent. This power isn't used often, but is greatly feared due to its power. Hedorah's strength and intimidation levels are at supernatural levels, his endurance is weak with out his constant stream of energy. As a god of darkness, he is mostly hated by those of the light path. Hedorah is unlike any earth creature and can only exist and thrive in the most hostile of environments ruined by pollution and ambient energies. Purified environments weaken him considerably. Hedorah's Realm: This monster of poison has created his own personal realm of deadly chemicals and acids. This realm is poisonous beyond measure and most living creatures here will die instantly. Hedorah spends most of his time here, as the earth is too purified and clean for his tastes most of the time. Most of the gods are immune to this realm's effects, but find it sickening and repulsive. Personality: Hedorah is sadistic, he loves to kill things slowly, torture them with lack of air slow acting venoms. Hedorah is pure evil and sees most of humanity as a nuisance to his plans, but they have their uses. Hedorah is isolated in comparison to the other Gods of darkness because he prefers his own realm to that of the earth. Hedorah is slow to act and is not known for his rage, instead he likes to slowly sicken his opponents with poisons. Hedorah is obsessed with the future, oddly enough, and he is a compulsive liar. He is not to be trusted. Worshipers: Hedorah worshipers are mostly sadistic people, as a God of darkness his worship is kept under wraps usually. 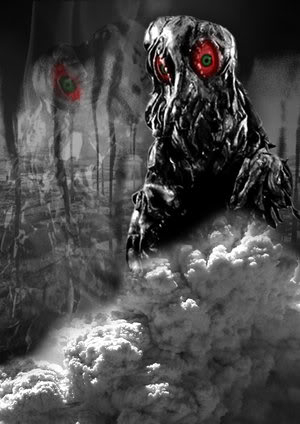 The smog monster pays little attention to his worshipers, but because they do worship him, he allows them to see how others will die. For this fact the most dedicated of Hedorah's followers are called Doomsayers. Hedorah is respected by assassins of all kinds due to his followers ability to create poisons, nearly without fail and always effective. For a price however that is usually high. This faith has very few temples, but the ones that do exist are filled with smoke and have fountains of acid. This is not a nice place to be, but the Doomsayers gather here at least twice a year to renew their psychic gift. The priests of this black faith do exist. They were black and Grey robes and have red, bloodshot eyes. They are sinister beings that are feared, and generally not accepted anywhere. Their weapons are acid vials and various poisons they hide on their person. Anybody can become a priest of the order. If one is killed somehow, the Poison Prince does not seem to care all that much about his followers, and replaces them with in a few weeks, the dead priest instantly dissolves into acid and explodes to attempt to scar its attacker forever. Or kill them. All of the gods of light hate this order, Biollante and Battra have the worst hate towards them though. Battles between these two clans are often and very brutal. Hedorah is the anti natural god, and seeks to destroy all of nature. Godzilla's order is often at odds with this one too. Hedorah's order will sometimes actively seek out Orders of the Light and attempt to destroy them, but their best and most effective method is to single members out and corrupt their minds with lies and their psychic gifts. Hedorah's followers almost never tell the truth save to one another. They are not to be trusted, but many people buy into their stories and by then it's too late. The Trial: To become a priest of the order, it is simple. You must corrupt three innocent souls into the order on your own and get them to help you in corrupting a holy place of another faith that they believed in. Any follower has as much time as they need to do this, but few want the responsibility it brings as being a leader. And you must accomplish this with out being caught. Capture could lead in death, and you'll never get to attempt the trial again, although Hedorah sometimes does not bestow the gifts of the priest even if the trial is successful just to see what his loyal followers will do. Temple: Hedorah's temple is a black place in an old part of the world, a pollution filled ancient city. Little is known about it, and few people not in the faith come back to tell about it, the story is different each time. Nobody really knows what it's like there. Future: Hedorah is a God doomed to failure, it was said once that his own poisons would be his undoing. Being immune to these, he does not make sense of this prediction. It was said that eventually even the Gods of darkness would grow disgusted with his very being and seek revenge for his actions. Hedorah is usually very careful about his actions because of this. Afterlife: Hedorah doesn't care about his followers after death. He offers their souls to Death Ghidorah in return for an alliance. And they are doomed to become slaves to the God of the Undead. Hedorah tells them that they are promised a dark paradise with un ending pleasures and a hedonistic eternity, this of course is a lie to attract followers. Any souls that are not offered to the Undead God are sent to the afterlife, and their lifestyles are usually judged harshly.